The opals we are providing are created. They are manufactured to mimic the properties of precious opals. The stones turn out beautifully and have all of the intensity and dramatic play of color one expects from the finest precious opal. 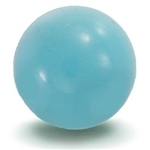 To top it off, these opals are perfect spheres and cost just a fraction of the price of the natural mined stone. Opals are believed to be mirrors into one's mind and emotions. They are considered to be powerful stones for transformation and manifestation, and should be used with an awareness of their intensity. Opals are a hard gel of silica. The beautiful play of color displayed by precious opal is attributed to it's highly organized micro-crystalline structure despite it's amorphous state. Opals even contain water and are slightly porous. I’ve had my unity necklace for many years and wear it nearly every day. 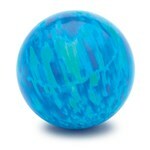 I’ve purchased all the opal marbles now, and love each of them. I get compliments on the necklace all the time. Service through GAYM has always been outstanding & I would purchase from them again. They are simply Beautiful! I love Opals! I now have a blue & a Purple one. I’ll get them one at a time as they are a bit pricey. Worth it however!